Target your content to particular personas. Draft your content to meet known needs. Craft the message to evoke a strong emotional response. Push a bit. Don’t play it too safe; if you do, you won’t evoke sufficiently high emotional reactions. Things that are shocking: Outrageous content that makes people think “oh, my!” works well, particularly on video. 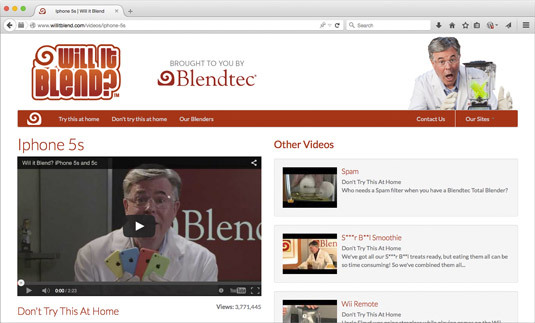 Blendtec has done used this technique spectacularly with its Will It Blend? Series. Blendtec’s Will It Blend? video series. Things that are puzzling: Content that’s weird, unexpected, and unexplainable often goes viral. Things that invoke a sense of relief: Things that make people feel better about their lot in life work well, even though this technique may be distasteful to many people. Failures: Disasters of a personal nature — from accidents to idiots doing disastrously stupid things — get lots of shares. This category also includes failings of organizations. Victories: Good guys defeating bad guys and honest human moments are viral gold. If you’re struggling to come up with something, just remember: Originality is overrated. Often, it’s much easier to curate existing content of your own or from other sources. Assemble a top‐ten list from the Internet archives. Sure, some of your audience may have seen at least part of the content before, but you may also turn up some underappreciated gems. If creating emotionally provocative content is one of your goals, you should consider the role of causes and controversies. People like talking about causes and injecting their opinions into controversies; it’s a type of social currency. These topics tend to push people’s buttons and evoke emotional reactions, so this sort of content needs to be handled delicately and sensitively. You don’t want to be perceived as using a popular cause for selfish or commercial purposes. If your goal is to position your brand as socially conscious or engaged and aware, however, common causes can work very well. Though common causes can generate excitement and buzz, they can also generate a lot of controversy. If you decide to use common cause content, be prepared for the possibility that there may be people who have strong opinions. You Know You’ve Lived in Boston Too Long When . . . These types of posts immediately connect with at least a portion of the audience. Your job is to make sure that the group the content appeals to is large enough to achieve your content goals. What do people actually share more than anything else? Here are the top topics on Facebook and Twitter in 2014. The first thing that should jump out at you is how similar those lists are. There’s a tremendous amount of overlap in terms of what people are talking about on these two key channels. The Facebook and Twitter stats give you some idea of the topics that tend to get traction, but what types of posts were most popular in 2014? Check out the top ten shared posts on Facebook in 2014. The difference seems to be emotion. The most‐shared content was highly emotionally charged, almost exclusively positive, and almost exclusively entertaining in nature. These examples don’t mean that positive, entertaining content about animals or relationships will go viral automatically. Content with these characteristics scored some big wins in the past, but other types of content also had viral success. It’s not enough to create content that people share. If you want to get the most out of any social media campaign, you need to follow up, engage, and be present on the channels.